If you're cleaning construction equipment, building exteriors or the filthiest garage floors day in and day out, this pressure washer will get the job done. 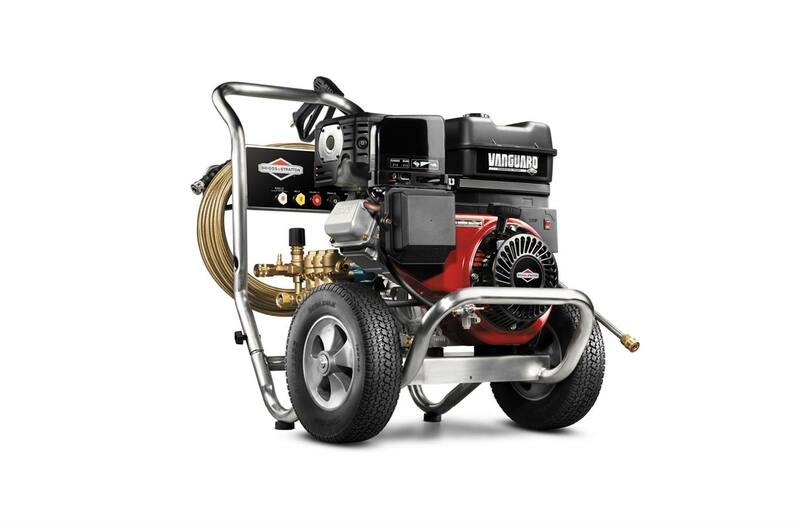 Briggs & Stratton Vanguard™ 13.0 Gross HP*** OHV Engine (391cc): This commercial-grade, single cylinder engine starts easily and features Overhead Valve (OHV) technology to run cooler and last longer: it's serious power for serious cleaning. Turbo Nozzle Wand: Cleans up to 40% faster than a standard spray tip. Pro-Style Spray Tips: Quickly and easily switch between four high-pressure pre-defined spray patterns from pin-point to wide fan (0, 15, 25, 40 degrees) for precise cleaning, plus one cleaning solution spray tip. Commercial-Grade CAT Pumps™ Triplex Plunger Pump: This pump is specially designed for high-performance, high-pressure output and long lasting durability on your job sites. Long-Reaching 50 ft. Steel Braided Hose: This heavy-duty hose features quick-connect fittings to help you clean further and work faster on the job. Easy, All-Terrain Mobility: Featuring 12" Never Go Flat wheels.